In which G.M. Norton finds himself all at sea. Last weekend, my beloved and I scooped up the two children and set sail for a day at the Imperial War Museum North. The Imperial War Museum North is based at The Quays in Salford, home to the likes of the BBC and Coronation Street. There are a few war museums dotted around the country, including two in Londinium. With February half-term on the horizon, we were invited for a special preview of some family ‘War at Sea’ activities. This included listening and taking part in a lovely story about a boy’s adventure on the high seas, along with making a message in a bottle and peering through telescopes. There was also a dressing up box, which my youngest was naturally drawn towards. The museum is completely free to enter, making it perfect to while away an afternoon as one delves into the important history of war. After the fun activities for the children, we explored the rest of the museum which included watching a Horrid Histories rationing episode, which was beamed onto walls around the main area of the museum. It’s an enormously striking museum, with an aeroplane hanging from the ceiling, tanks, an old fire engine and a rather interesting sitting room. We were warned on arrival that the museum building was designed to be a little disorientating with sloping floors and obtuse angles providing an attack to the senses, if you will. Designed by architect Daniel Libeskind, the museum is clad in aluminium and features three interlocking shards, representing conflict on land, water and in the air. The overall concept is of a world shattered by the effects of war, with fragmented pieces stuck back together. Pretty clever, what? Admiring the architecture is reason enough to visit this museum, especially the 55 metre high Air Shard, which is a jagged shaped viewing platform. Alas, it proved a little too unnerving for us. Deciding against the climbing of 180 steps, we opted for the lift, which was a unique experience as the metal box climbed up at an angle. Upon exiting the lift and standing on a mesh gangway, nearly 100 feet in the air, we decided we’d had enough excitement for one day and went straight back down to safety! If you are good with heights and like to sail close to the wind, this would be just your cup of tea. Which is what we headed for in the museum’s Watershard Cafe. One thing worth remarking - the museum shop is truly magnificent! During my adolescent years, I always enjoyed visiting a museum gift shop for a little souvenir of my day. However, in recent years, I’ve been a little disappointed by modern day gift shops. Not in this case though! My youngest decided she must have a tiny stuffed mouse and my eldest couldn’t resist a bouncy ball with an aeroplane inside. 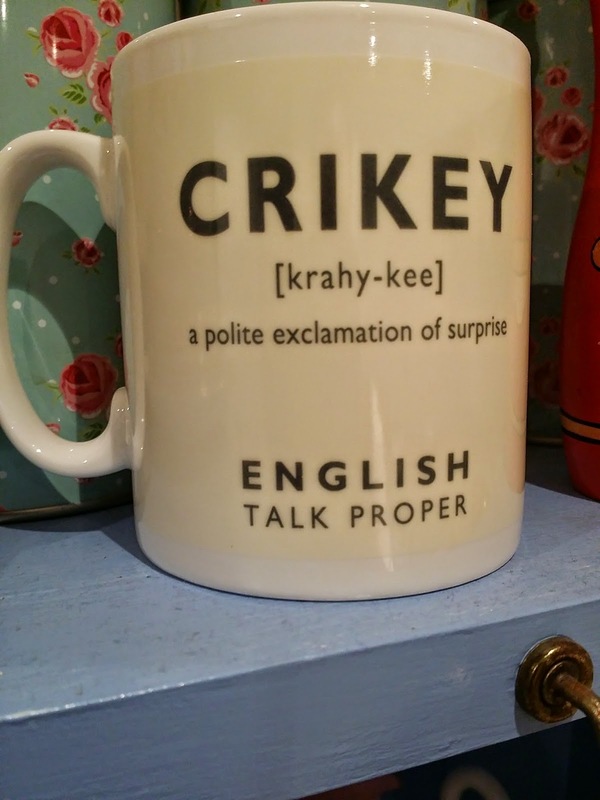 I also took home a little something, namely, a cup adorned with the word ‘Crikey’. At this juncture, I must confess to having a little mishap when I knocked off a display bottle of perfume in the shop. Naturally, I quickly looked around for a child to pin the blame on before realising that no damage had been done. If there had, perhaps I could have explained how it was in homage to Libeskind’s concept for the museum - except the perfume bottle would have been shattered in clumsiness rather than conflict. If you reside in T’North, make sure you pay the Imperial War Museum North a well-deserved visit. There’s lots of activities for the little ones during February half-term. Perfect if the weather is letting the side down. There's also a new exhibition in the summer which I'm enormously looking forward to, which marks the 75th anniversary of the Second World War Blitz. More musings will be here at the usual time of next Saturday at 4 o'clock. Why Mr Norton, I'm stunned you weren't more impressed with the Harrier. After your time? *Chortle* Of course, I appreciate our winged contraptions but I'm not really one for casting furtive glances at them. Cheese on the other hand...Three times up the Air Shard? Gadzooks! You're brave, ma'am.